Christopher Burkett has been making photographs since 1975. With his wife Ruth by his side, Christopher roamed the United States in order to look for amazing views. He’s scaled mountains, crossed rivers, and waited patiently for the perfect shots in hopes of sharing them with everyone. His story is both inspiring and educational. Welcome to join us the reception as well as the tour guide by Dr. Edward Chiu, the curator of 1839 Contemporary Gallery at Saturday afternoon 15:00 on March 9th. 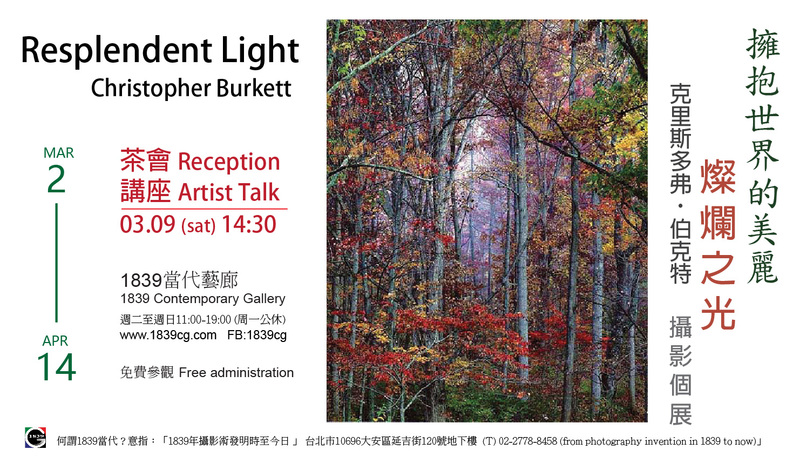 To share how Burkett use 8×10 negative file to transform into positive file till print in color paper.